'Nose-y' Bacteria Could Yield A New Way To Fight Infection : Shots - Health News The search for lifesaving antibiotics is on. Scientists have turned up one promising candidate in an unlikely place — the human nose. Once scientists grew these Staphylococcus lugdunensis bacteria in a lab dish, they were able to isolate a compound that's lethal to another strain commonly found in the nose that can make us sick — Staphylococcus aureus. With antibiotic-resistant super bugs on the rise, researchers are on an urgent hunt for other bacteria that might yield chemicals we can harness as powerful drugs. Scientists once found most of these helpful bacteria in soil, but in recent decades this go-to search location hasn't delivered. Now, researchers at the University of Tübingen in Germany say that to find at least one promising candidate, we need look no further than our own noses. 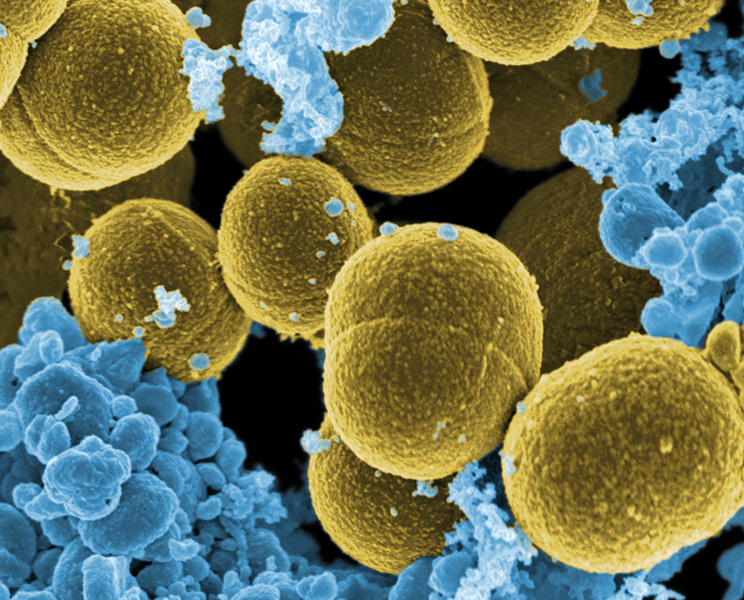 The scientists report Wednesday in the journal Nature that a species of bacteria inside the human nose produces a substance capable of killing a range of bacteria, including the strain of drug-resistant Staphylococcus aureus known as MRSA. The Tübingen team is delighted with their find. "It was totally unexpected," says study author Andreas Peschel. 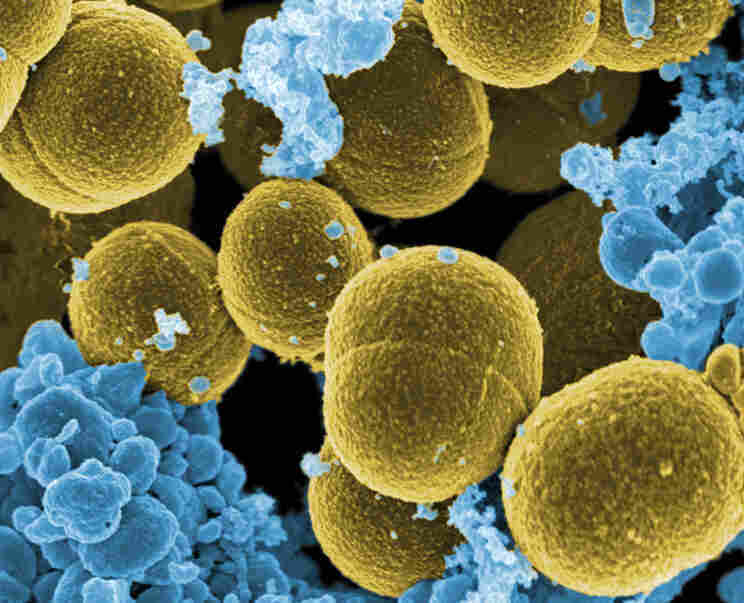 The scientists already knew that S. aureus lives in the noses of about 30 percent of humans, usually without causing harm — most people never know they are carriers of the bacterium. But if the body becomes compromised (whether by surgery, physical trauma, an underlying illness or suppressed immune system) the little cache of S. aureus in the nose can suddenly launch an attack against its human host. 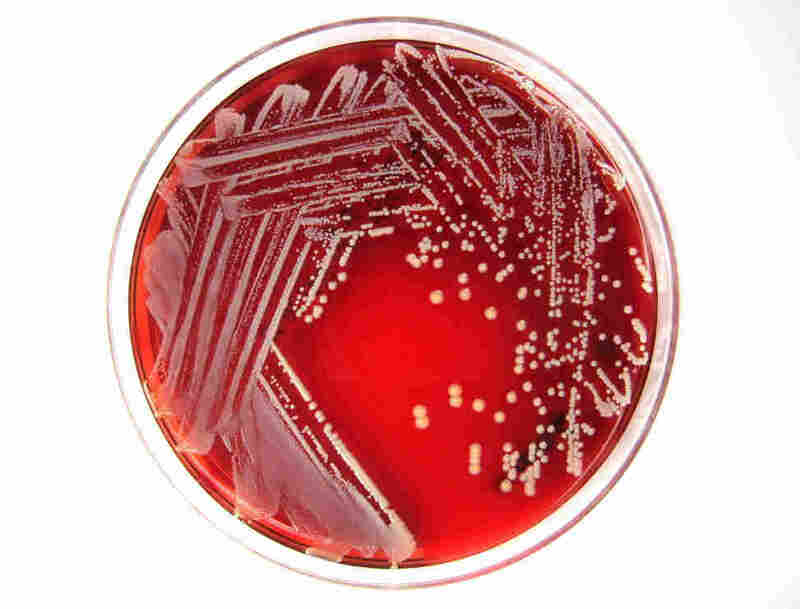 And if the strain of bacteria is MRSA, that infection can be lethal. 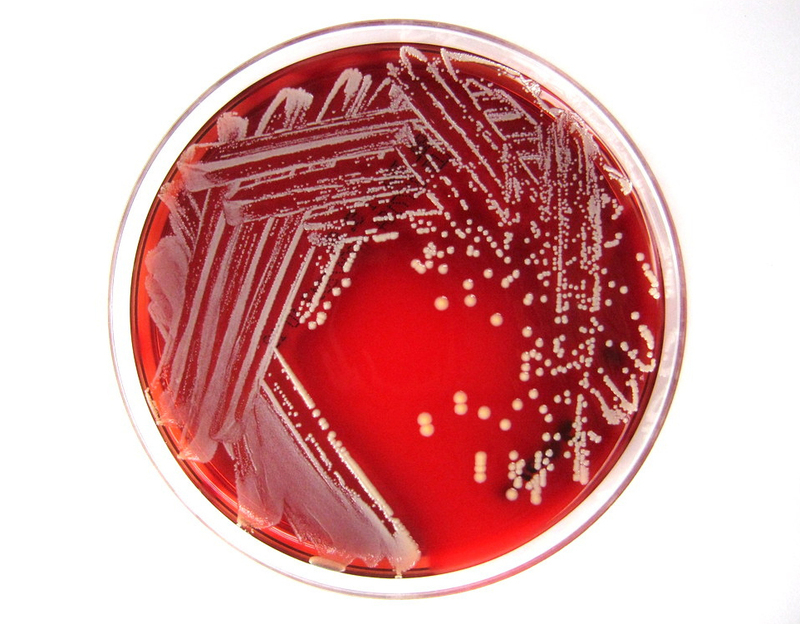 Drug resistant S. aureus bacteria — aka MRSA — escape destruction by human white blood cells. The bacteria are tinted yellow in this scan, and blood cells are tinted blue. The scientists wondered how 70 percent of human noses are able to avoid harboring S. aureus. They guessed it might have something to do with neighboring bacteria. So the researchers pitted 90 different human nasal bacteria in one-on-one battles with S. aureus in the lab. Indeed, one of these bacteria — Staphylococcus lugdunensis — prevented the dangerous pathogen from growing. They then studied the arsenal of chemicals that S. lugdunensis produces until they found one that stops S. aureus in its tracks – a new antibiotic that they named lugdunin. Follow-up work confirmed that lugdunin can treat S. aureus skin infections in mice, and limit the spread of S. aureus in a rat's nose. Lugdunin may already be keeping S. aureus out of our noses. In a group of 187 hospitalized people, the same scientists found S. aureus in the noses of just 5.9 percent of people who also harbored the lugdunin-producing bacteria, but 34.7 percent of those who didn't. Other recent studies have shown that bacteria living in humans carry genes that have the potential to make antibiotics. The Tübingen study takes those results a step further by showing that an antibiotic produced by a bacterium in the human nose can successfully treat an animal's infection. "This paper is a really nice follow-up," says Dr. Nita Salzman, a pathologist at the Medical College of Wisconsin. "It's a sort of proof of principle that the microbiome is a good source for novel antibiotics." The researchers have applied for a patent for lugdunin, but say that the prototype antibiotic is still many years away from being ready to treat humans. The really important contribution of this study is not lugdunin itself, says microbiologist Kim Lewis of Northeastern University, but rather the new approach for finding antibiotic-producing bacteria within our own bodies. "The reason we ran out of antibiotics in the first place is because most of them came from soil bacteria and they make up 1 percent of the total [bacterial] diversity," Lewis says. Scientists kept searching in soil, he says, because they already had some success there and know that soil bacteria are exceptionally good at producing antibiotics. But now it's time to look within us. And the team in Tübingen has only just begun their hunt. "We have started a larger screening program and we're sure there will be many additional antibiotics that can be discovered," says Peschel. NPR's Joe Palca contributed the audio version of this story.